I've been enjoying the challenge of making something each day using my JustRite Stampers...For today's project, I created a gift card holder, that uses the JustRite Small Letter Set - a must have for creating words to go around your circles, SU's Snow Burst and Holiday Treasures Designer Series Paper. Cut your card stock to 11" x 4"
Score at 1-3/4", 4-7/8" and 8". The 1-3/4" is your top flap - here you can see I used my coluzzle to cut out a half circle, this is covered by my circle medallion which holds the flap closed. 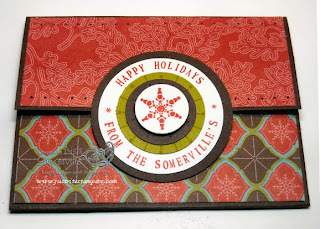 I used my JustRite Stampers to create my sentiment around the edge of my 1-3/4" circle. The snowflake images are from the Snow Burst Set. Here's a view of the inside when the Gift Card is opened. I used my Word Window punch (punched several times to create the opening for my gift card. (This is the bottom panel - you'll layer your DSP if desired, then punch your word window, then fold up and tape. The sentiment used here is from Many Merry Messages. Oh Lisa I love this gift card holder!! 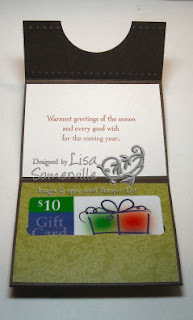 Adorable personalized gift card holder, love the layout! Very cute idea! With Christmas coming on fast, I think I will borrow your idea and get busy:) Thanks for sharing!